will someone explain it to me?! A picspam for challenge twenty-five over at picspammy - Year End Lists. 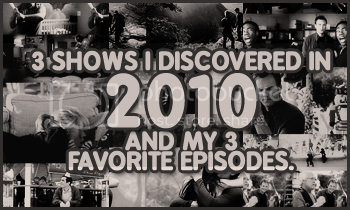 I discovered a few awesome shows this year (mostly because I'm always tardy to the party) so I thought I'd share these shows by choosing 3 episodes that I loved from each of those shows. The shows are: Modern Family, Community and Harper's Island. I'm going to warn you now and say Harper's Island is pretty spoilery. I tried not to spoil but most of the reason why they're my favorite episodes is because of the spoilers/revelations. If you want a spoiler free Harper's Island picspam then go here especially if you're thinking of watching it but don't want to be spoiled. 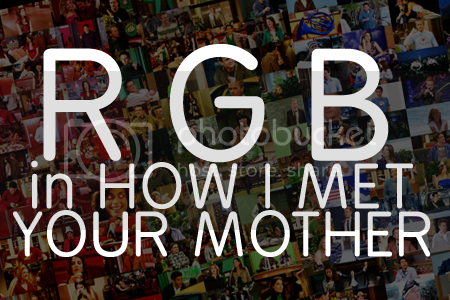 I find most sitcoms are colourful and I didn't want to do Friends and I felt that How I Met Your Mother is a very colourful show too. There are loads of color themes in the show like McClaren's green and red interior, Ted's apartment is green and red, while Barney's apartment is mostly blue, and Lily and Marshall's is yellow and red. I thought it would be a pretty good example of the challenge. This month's challenge is to illustrate a song. I haven't done a OTH/Brooke spam in a while and this song is taken from a fanmix I was planning a few years ago and figured this would be a good opportunity to do a Brooke spam as well as incorporating my fanmix idea. The song is Mouth Shut by The Veronicas and is basically to sum up Brooke's feelings about her relationship with Lucas circa end of season 3/beginning of season 4 as well as how their relationship was doomed from the start because she didn't say the things she should have said. This was basically just an excuse to relive my Brooke/Lucas days too. Hello, everyone. Forever ago waxandstrings said I could post here, so I'd like to thank her again! A picspam for challenge twenty-one over at picspammy - Brain Twin. A picspam for challenge twenty over at picspammy - Tropes. why are we friends? do you ever wonder?